Keeping your exhaust system in good working condition is vital for fuel mileage, the environment and your safety. We will discuss how the exhaust system works, how it usually fails, and the best way to repair it. Your car’s exhaust system carries away the gases created when the fuel and air are burned in the combustion chamber. These gases are harmful to humans and our environment. Frequent checks of your exhaust system is a must to provide for you and your family’s safety. Make sure there are no holes in the exhaust system or in the passenger compartment where exhaust fumes could enter. Let’s begin by listing the parts of the exhaust system and their functions. Between all of the above mention parts is the exhaust pipe which carries the gas through it’s journey out your tail pipe. Exhaust tubing is usually made of steel but can be stainless steel (which lasts longer due to it’s corrosion resistance) or aluminized steel tubing. Aluminized steel has better corrosion resistance than plain steel but not better than stainless steel. It is however cheaper than stainless steel. Well the worst enemy of your exhaust system is corrosion…. or more commonly known as rust. Rust is caused by moisture reacting with the iron in the steel and forming iron oxide. Moisture, or water vapor is present in the exhaust as a by-product of combustion and the catalytic converter. Moisture can also come from the outside in the form of rain. Short trips in your car can shorten the life of your exhaust system. When you shut down your engine whatever water vapor is in the pipes condenses and turns back into a liquid. On a short trip the water never has a chance to get hot enough to turn back into water vapor and just stays in the system and rusts away the pipes. If you drive for short distances consider replacing your exhaust system with stainless steel when the plain steel one rusts through. If you drive more than 15 miles at a time then you should not have to worry about this. If you live in an area which uses salt on the roads in the winter time, make sure to wash the underside of you car with water every few weeks. Salt speeds up the corrosion process and getting it off as soon as possible will help stop the corrosion. Make sure you run the engine after washing to drive off all of the water on the pipes. The next part in line to go is the muffler. 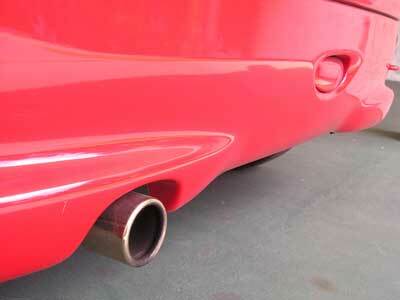 Most of the time mufflers rust through and need to be replaced. There are allot of options out there for replacement mufflers. Some cheap and some expensive. It holds true….. you get what you pay for. If you plan on keeping your car for any period of time, spend the extra cash and get an OEM muffler or a high quality name brand muffler. That’s about it for the exhaust system, just remember that rust is the biggest enemy to your exhaust system. Take the above mentioned steps and your exhaust system will last a long time.